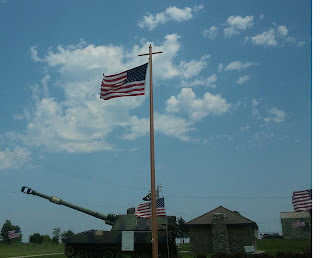 New Genealogy and History Data posted for week of June 2, 2011 - July 3, 2011. Aunt possibilities: Cassandra, Alice, Liota or Lizzie Scott. or Lillie, Sophia, Jessie or Lidia Allen. 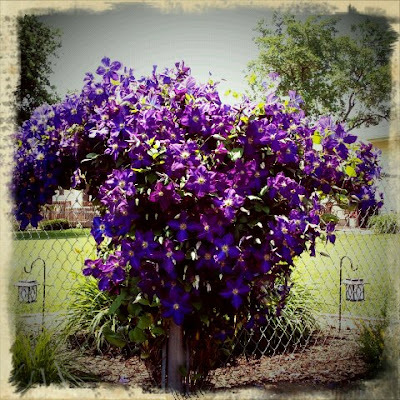 New Genealogy and History Data posted for week of June 20, 2011 - June 26, 2011. New Genealogy and History Data posted for week of June 13, 2011 - June 19, 2011. This is the face of my genealogy and they are beautiful! This post is in response to the very offensive image posted in the LA Weekly with an article regarding the upcoming SCGS Jamboree. You can read about the article here. Whether the author or the editor selected the photo matters little, it was published. The photo depicts a very uneducated and outdated stereotype of genealogy. Boring! Come up with something new and original, then you can call yourself a journalist. p.s. If you've ever wondered how large the genealogy market is, call the LA Weekly tomorrow they should have the figures for you! 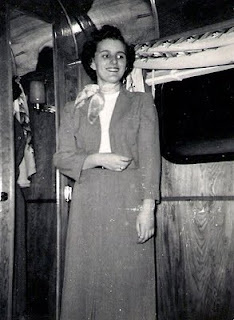 New Genealogy and History Data posted for week of June 6, 2011 - June 12, 2011. I recently spent some time watching the updated Google Earth videos, offered from Lisa Louise Cook at Genealogy Gems as part of the premium membership. What is particularly exciting about the updated videos is they are iPad compatible! Lisa updated them in QuickTime or some format other than Flash. Thank you so much Lisa, I hope others with webinars and videos quickly follow your lead! In Video #6 we see how to use and create historic overlays in Google Earth. I've had a 1907 Plat Map for Amherst, Nebraska for some time and in the upper right corner, you see the name Mary Evingham. 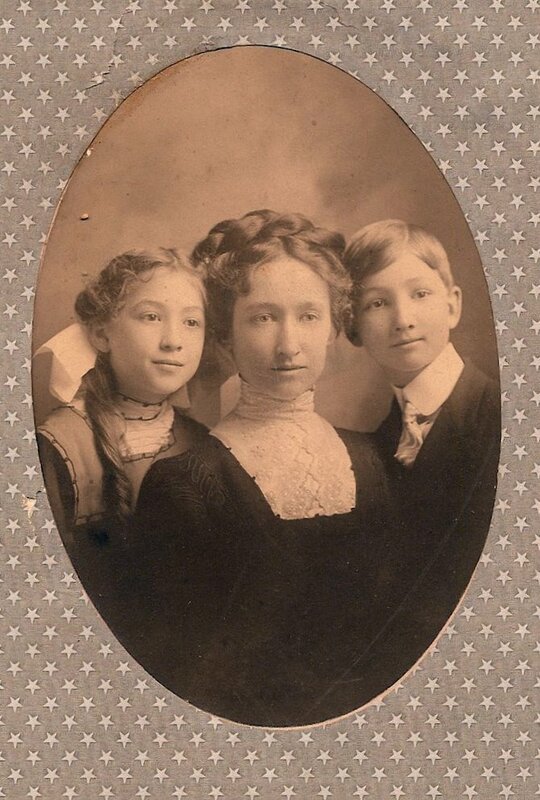 That is my great grandmother who I know next to nothing about. In addition to this plat map, I also have the Warranty Deed showing her purchasing the land in 1906 and the Warranty Deed showing her selling the land in 1919. I've found Mary and daughter Una on the 1910 census living in Amherst and as there are no other Evinghams listed in Amherst, I'm confident this is my Mary Evingham. 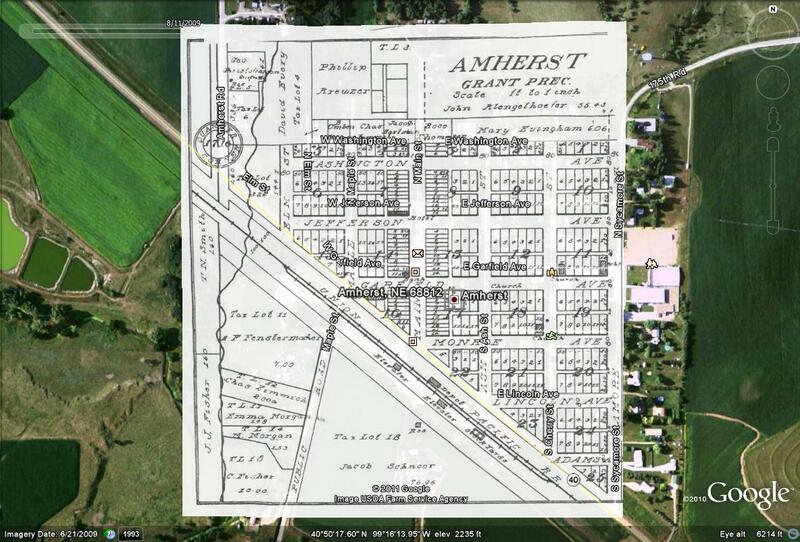 I used the historic overlay option in Google Earth to add the 1907 map to today's view of Amherst. What was once three undivided acres in 1907 now has five homes on it. 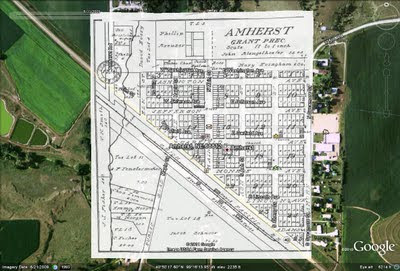 I can also see that the Union Pacific Railroad ran through Amherst at one time, but no longer does. I did some searching on the Buffalo County Nebraska GenWeb site and found this photo of the train depot. Mary and her daughter Una lived in Fairbury, Illinois in 1900. A 1897 map of Fairbury shows a railroad line. 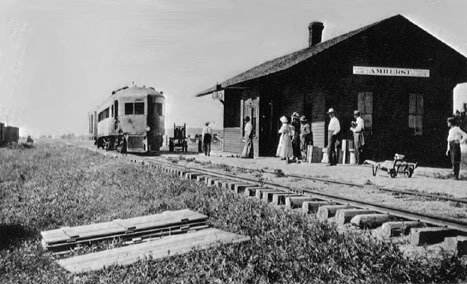 They may have arrived in Amherst from Fairbury at this very depot. The railroad line also shortens the distance to Newark, New Jersey. Una married my grandfather who was born, raised and died in Newark. I've pondered how they could possibly have have met in 1915 living so far apart. After my grandfather graduated from college, did he take a trip west by train and make a stop in Amherst? I'm going to spend more time with Google Earth and map overlays, it's very interesting to note the changes that take place over the years. I will also spend more time with the Fairbury, Illinois map, something on that map caught my eye that warrants further research.